After Quinnipiac head coach John Delaney earned his 100th career win on Saturday, the Bobcats (8-11 overall, 3-0 MAAC) won both games in its doubleheader on Sunday by scores of 5-4 and 3-0 to sweep the weekend series against the Saint Peter’s Peacocks (0-17, 0-3 MAAC). 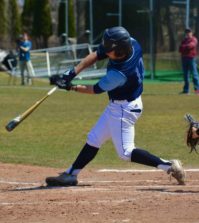 Having to play a doubleheader and play at home for the first time, Delaney made sure that his team didn’t overlook Saint Peter’s. The Bobcats started off the first game with a bang, as junior outfielder Andre Marrero blasted a home run over the left field wall to give the Bobcats a 2-0 lead in the first inning. However, the Peacocks wouldn’t go away as they scored three runs in the fifth inning to take a 3-2 lead. Marrero wasn’t done yet, as he responded with his second home run of the day in the bottom half of the fifth, as it would help seal a 5-4 victory. “I haven’t hit two home runs since little league, so it was pretty cool to hit them today,” Marrero said. Game two presented a different challenge though as redshirt junior RHP Christian Nicoliso made his first start of the season, but you wouldn’t know it. He threw five scoreless innings, struck out five batters and only allowed three hits. 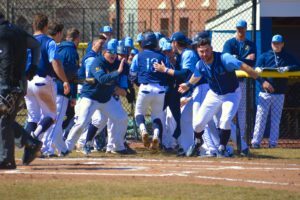 Quinnipiac couldn’t find an offensive rhythm for most of the game, as it was held hitless through seven innings until graduate student catcher Anthony Cruz laid down a bunt single. Marrero continued to be the Bobcats’ offensive threat as he hit a big two-out, RBI single in the eighth to help seal a 3-0 victory. Marrero had a total of six RBI’s and his big day at the plate certainly didn’t go unnoticed. 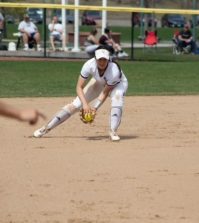 With a 13-0 win on Saturday against Saint Peter’s to add onto the doubleheader Sunday, Quinnipiac went undefeated in its first weekend of MAAC play. Quinnipiac will get to stay at home, as it is back in action on against the University of Rhode Island on Tuesday, March 26 at 3 p.m.